The year 2014 has been a catalyst for the customer relationship management industry. Its usage has propagated on almost all customer interface platforms like desktops, tablets, mobiles etc. Such expansions are part of digital expansion initiatives of corporate of all sizes. IT infrastructural plans of many companies factor in the need for CRM implementation for present or future purposes. The one big user group that is in the forefront of CRM usage are sales personnel. This is attributable to the fact that they are always in touch with the customers, the growth engine for the company. It is for this reason that laptop remains the preferred medium of choice for CRM users. However, with the proliferation of smartphones and tablets in developing countries, where economic growth is the highest, is expected to overtake laptops in the coming few years. The below statistics will give you an idea about the usage preferences. CRM investments have been traditionally huge with phased returns on investments (ROI). With the kind of budget involved companies take precautions and preliminary research while selecting the right partner and the right areas for CRM implementation. 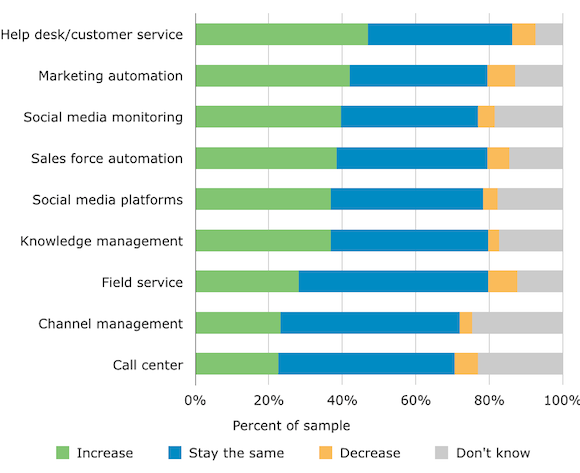 According to a recent survey conducted by Software Advice, a premier software research agency for online CRM, customer service and marketing automation has been identified as key areas for investment growth. Social media integration/monitoring and sales force automation follows closely. The below graphic will give you a better understanding. help of high quality interactions aided by automation will be the growth engine of the future. The wide scope of lead management for marketing also underlines the importance of marketing automation. It enables companies to have more targeted customer engagement which are feasible in multichannel environments. As CRM awareness grows, many industry verticals are taking up customer relationship management. 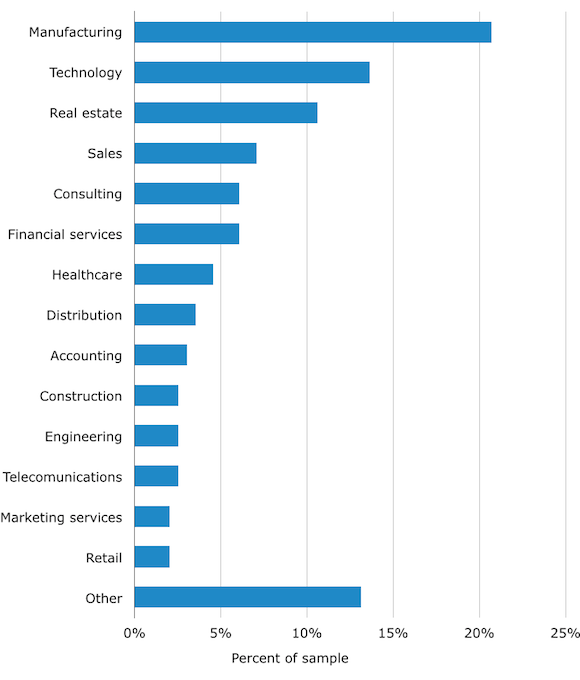 In the same research done by Software Advice, it was found that manufacturing industries top the list followed by technology and real estate. Majority of the implementations are undertaken by small businesses that have up to 100 employees. This is natural as the maximum benefits of CRM are enjoyed by SMBs, which is discussed in our next point. The below statistic shows the number of users and their share. C. Who benefits the most? As you can see from above graph, large enterprises also gain immense satisfaction from implementing and utilizing cloud based CRMs. This is in line with CRM advisor Brian Vellmure’s statement that tech solutions today are either built to solve the needs of very large organizations, or very small ones. The key here is go for scalable CRM implementations that grows as the organization, thus leading to reduced bottlenecks and greater increase in lead conversions. The growing phase of CRM means that the challenges facing the industry are unique and constantly evolving. Customization has emerged as the most important key challenge facing the CRM industry today. This is vital because the ability to customize according to client preferences is what differentiates the best CRM solution from the rest. Integration is a close second as many clients have existing IT infrastructure that have become obsolete but cannot be thrown due to the huge write offs involved. The below stats will present a clear picture of the key obstacles facing CRM growth today. What do the above findings imply for CRM vendors? 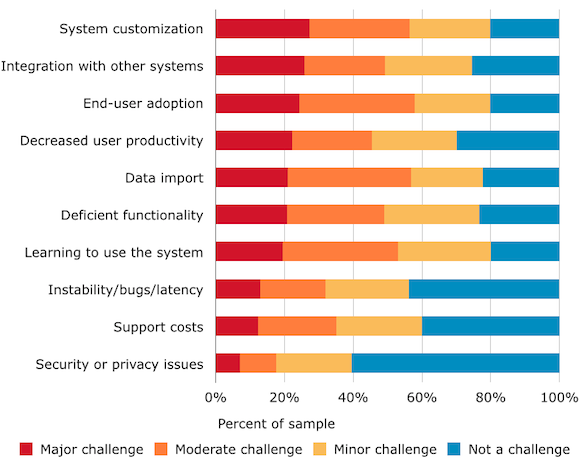 CRM users cited system customization and integration as top pain points, with over 26 percent describing each as a “major challenge.” As such, vendors should continue to improve their product’s integration capabilities in order to attract customers seeking to consolidate and coordinate across systems.